Equine Dreams sends its heartfelt gratitude to Northwestern Medicine Valley West Hospital for their recent generous donation toward feed and care for their therapy horses. “We feel so blessed to be in such a caring community, and to have the continued support of Valley West Hospital," said Head Instructor and Board Member Windy Kopecky. Part of the hospital’s community benefit program objectives are to improve access to health services, and through programs like Equine Dreams we can provide Equine Assisted opportunities for children and adults with special needs. For more information, visit www.nm.org. 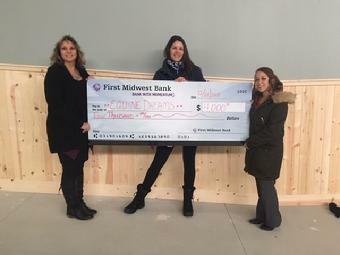 Equine Dreams is the proud recipient of a generous grant from the First Midwest Charitable Foundation in the amount of $4,000. Funds will be used toward the completion of an indoor mounting ramp which will allow the program to serve an increased number of participants year round. “We are so very blessed to have the continual support of the First Midwest Charitable Foundation and of our community”, said Rick Mason, Board President and Head Instructor for Equine Dreams. Since, 1996, Equine Dreams (www.equinedreams.org) has provided Therapeutic Equine Assisted Activities free to children and adults with special needs in counties such as DeKalb, Kendall, Kane and LaSalle. 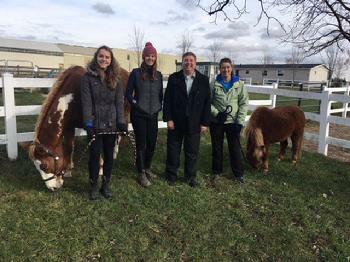 Some of the free services they provide include therapeutic horseback riding, miniature horse visits to hospitals, nursing homes and day schools, a sensory trail, veterans program and RDA Dressage Horse simulator lessons. Equine Dreams is a PATH International Premier Accredited Center, and is dedicated to improving the quality of life for children and adults with disabilities. This program is unique in that it is a free program run by volunteers. The First Midwest Charitable Foundation is a private foundation headquartered in Itasca, Illinois. Funding for the foundation comes from First Midwest Bank. 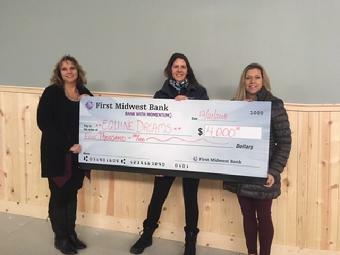 The work of the First Midwest Charitable Foundation plays a vital role in support of the overall First Midwest Bancorp, Inc. strategy through its mission to fund programs that improve the lives of women and children in our area. The Foundation places an emphasis on programs that encourage participants to take the lead in improving their own lives and which generate tangible socioeconomic benefit for the participants and their families. Thank you to Walmart in Morris, IL for awarding Equine Dreams a $500 grant! We are so thankful for your continued support! Newark, Illinois, July 13, 2018 – The Grainger Foundation, an independent, private foundation located in Lake Forest, Illinois, has donated $5,000 to Equine Dreams in support of its care and feeding of therapy horses. Caption: DuPage Foundation awards grant to Equine Dreams. From left: Ruth Carlson, DuPage Foundation Grant Committee; Windy Kopecky, Equine Dreams; Mary Kay Kluge, DuPage Foundation Trustee. Newark, Illinois— Equine Dreams was one of 36 not-for-profit organizations to receive a grant at the DuPage Foundation’s Spring Grant Awards Breakfast held on Tuesday, June 12, at Glen Oak Country Club in Glen Ellyn. The DuPage Foundation awarded more than $500,000 in grants to organizations working in the area of Health and Human Services. The grant received will help assist with the purchase of a van to support therapeutic miniature horse visits to individuals with special needs in DuPage County hospitals. 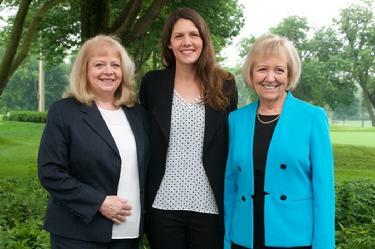 The DuPage Foundation is DuPage County’s philanthropic leader. Established in 1986 to raise the quality of life throughout DuPage County, the Foundation helps area residents and organizations realize their unique charitable goals, provides impactful support to our community’s not-for-profits, and fosters key partnerships to address critical issues affecting DuPage County. As a 501(c)(3) public charity, the Foundation receives contributions and bequests from individuals, corporations, organizations and foundations looking to make a difference for our community and the causes about which they are most passionate. Since its inception, the Foundation has grown to $95 million in assets and awarded more than $35 million in grants to not-for-profit agencies serving the residents of DuPage County and beyond. For more information about the DuPage Foundation, visit www.dupagefoundation.org. Equine Dreams is proud to be the recipient of a very generous grant from the IDEAL INDUSTRIES FOUNDATION, which will go toward the care and feeding of our therapy horses. “Equine Dreams is beyond thankful to the IDEAL INDUSTRIES FOUNDATION for their long-standing support of our mission to nurture abilities in individuals with special needs. We appreciate their commitment to our organization,” said Windy Kopecky, Board Member and Head Instructor for Equine Dreams. Located in DeKalb County, the IDEAL INDUSTRIES FOUNDATION provides support to educational, health and human services programs and the arts. For more information on IDEAL INDUSTRIES, visit www.idealindustries.com. Equine Dreams is the proud recipient of a grant from The Horizons Unlimited Foundation, which will go toward the care and feeding for our therapy horses. Our patient, responsive horses carry our riders beyond the confines of their disabilities. The horses are the star players for the program, and allow us to witness miracles each week. "The results we see are amazing. Our program is truly blessed. It is because of generous foundations like the Horizons Unlimited Foundation that we are able to continue our mission of nurturing abilities in individuals with special needs. We are so very grateful for their continued support,” Windy Kopecky, Board Member and Head Instructor for Equine Dreams. Located in DeKalb County, the Horizons Unlimited Foundation provides support to cultural, educational and human service programs established and run by small, locally based organizations. Their mission is to expand the horizons for children and their families, and increase their ability to fully realize their physical, emotional, mental and spiritual gifts. 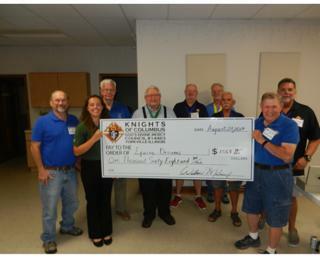 Equine Dreams wishes to express its sincere appreciation for a contribution in the amount of $1068 from the Knights of Columbus Illinois State Council. 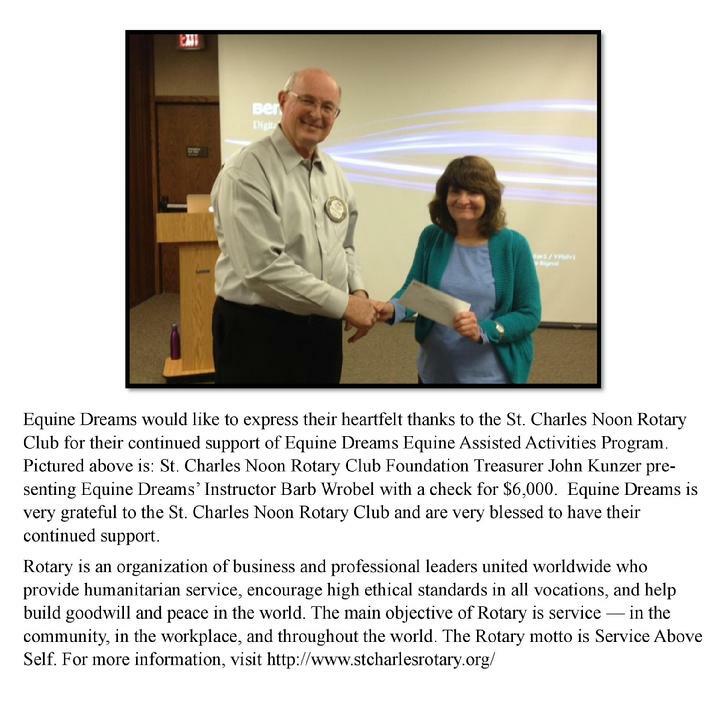 Equine Dreams is grateful for this generous gift and for their continued support of Equine Dreams’ mission. The Knights of Columbus was officially chartered in 1882 as a fraternal benefit society. Their founding principles are charity, unity, patriotism and fraternity. Social and intellectual fellowship is promoted among members and their families through educational, charitable, religious, social welfare, war relief and public relief works. The Knights of Columbus have grown from several members in one council to over 14,000 councils and 1.8 million members throughout the United States, Canada, the Philippines, Mexico, Poland, the Dominican Republic, Panama, Bahamas, the Virgin Islands, Cuba, Guatemala, Guam and Saipan. For more information, please visit their website at www.KofCYorkville.org. Equine Dreams is the proud recipient of a $15,000 grant from the DeKalb County Community Foundation. The funds will go towards their horse stall barn expansion project. “We are beyond grateful to the DeKalb County Community Foundation for their continued support. It is because of generous foundations like theirs that we are able to continue our mission of nurturing abilities in individuals with special needs’, Windy Kopecky, Board Member and Head Instructor for Equine Dreams. Equine Dreams expresses their heartfelt appreciation to the DeKalb County Community Foundation for their generous support. The DeKalb County Community Foundation’s mission is to enhance the quality of lives in DeKalb County by proactively addressing community needs and expanding, managing, distributing philanthropic resources. Equine Dreams is pleased to announce that it is the recipient of a $100,000 grant from the Illinois Children’s Healthcare Foundation. The funds will be used towards a program expansion to purchase a life size Therapeutic Horse Simulator that will work to improve the quality of life and build resilience in children with disabilities through Equine Assisted Activities. Funds will also go toward building a climate controlled room for the simulator. The project will seek to improve and sustain physical, cognitive, behavioral/mental health and/or social skills of children with disabilities in the underserved rural areas in Illinois by providing year-round therapeutic Equine Assisted Activities on a life-size, equine simulator. “Our heartfelt thanks go out to the Illinois Children’s Healthcare Foundation for their support of our mission to nurture abilities in individuals with special needs. We appreciate their confidence in our ability to provide a unique and beneficial service to this community.” said Windy Kopecky, Board Member and Head Instructor for Equine Dreams. The Illinois Children's Healthcare Foundation (ILCHF) has a single vision: to ensure every child in Illinois has the opportunity to grow up healthy. Working through grantee partners across the state, the Foundation focuses its grant making on identifying and funding solutions to the barriers that prevent children from accessing the ongoing health care they need. The Foundation's philosophy is that health care must address the whole child. They focus their current grant making in two high needs areas in children's health: Improving oral health of Illinois' children and addressing the mental health needs of children in Illinois. ILCHF also designates each year a portion of its grant making dollars for those opportunities that are innovative programs or emerging needs in children's health care in the state of Illinois. For more information on ILCHF, visit their website at: http://www.ilchf.org/aboutilchf.html. Equine Dreams is pleased to announce that it is the recipient of a $10,000 grant from the Community Foundation of the Fox River Valley. The funds will be used to purchase a tractor. “A tractor keeps Equine Dreams future operating costs down through allowing us to manage our property independently. We will not have to hire someone to plow our drive in the winter, and will be able to manage our pastures and maintain our sensory trail. Our heartfelt thanks go out to the Community Foundation for their continued support of our mission. We appreciate their confidence in our ability to continue to provide a truly unique and beneficial service to this community.” said Windy Kopecky, board member and instructor for Equine Dreams. The Community Foundation of the Fox River Valley is a non-profit, tax-exempt, philanthropic organization that administers individual charitable funds from which grants and scholarships are distributed to benefit the citizens of the Greater Aurora Area, the TriCities and Kendall County, Illinois. Founded in 1948, the Foundation provides a simple and powerful approach to charitable giving. Individuals, families, businesses and organizations have the opportunity to custom design their own named funds that reflect their charitable goals and interests. Since its inception, the Community Foundation has grown to more than $75 million in assets and has awarded more than $60 million in grants and scholarships. For more information on the Foundation, visit www.CommunityFoundationFRV.org.